Gerald Tomas "Jerry" Garza, Sr., age 48, grandson of the late Tomas Arias (founder and first president of the Puerto Rican Home) passed away at his residence in Avon Lake following a lengthy illness. He was born April 9, 1970 in Lorain, Ohio. In 1988 he graduated from Southview High School in Lorain and later enlisted in the Army having served during Desert Storm. Gerald enjoyed music, dancing and was known for always joking around. Above all he loved his family, kids and grandkids. Surviving are his parents, Linda Garza of Avon Lake and Gerard F. Garza of Lorain; sons, Julius Garza and Xavier Garza of Avon Lake; daughters, Gabriella Garza of Sandusky, Corrina Garza of Lincoln Park, Michigan and Felicita Garza of Avon Lake; as well as, 4 grandchildren and brother, Michael Garza of New York and step-brother, Matthew Celeste of Cleveland. 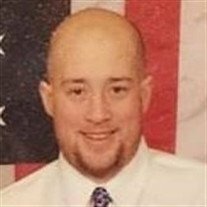 The family will receive friends on Friday, February 1, from 4 - 7 p.m. in the Dovin Funeral and Cremation Specialists, 2701 Elyria Avenue, Lorain. Mass will be held on Saturday, February 2 at 12:00 p.m. in Sacred Heart Chapel, 4301 Pearl Ave, Lorain. Burial will follow in Calvary Cemetery, Lorain.